There was a while when picture disc singles were all the rage. This was the first one I ever bought. A single that hit the charts in February 1979, peaking at #17. 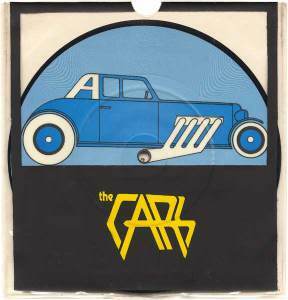 The thing was, nobody meaningful in the UK seemed to take The Cars all that seriously, (by that I mean music journalists – the fact they got a couple of Top 40 hits means enough people liked them to buy things – or maybe we were all suckers for the picture discs). They did however, do quite well over in their own country. I suppose that we Brits had enough of our own home-grown new wave singers and bands to talk and write about that we could ignore what was happening over on the other side of the big pond. Maybe it was also the fact that the early releases were produced by Roy Thomas Baker who had a close working relationship with Queen. But they were never really hip or trendy in the UK despite the early singles and LPs being a great mix of spiky guitars and pop-orientated synths. Just What I Needed had in fact been the band’s first success in the States in 1978, but was only released over here as the follow-up to My Best Friend’s Girl. After that, more or less nothing. But back home, they continued to greatly outsell the likes of Blondie and Talking Heads, both of who had emerged around the same time, but both of who enjoyed great critical and commercial acclaim in the UK and across Europe. There’s no way I’m not going to make any case for The Cars being a band that should be in everyone’s record collection, but I will defend the greatness of their early hit singles in the UK. They sound a bit like Squeeze…….